With continuous innovations in the technological fields of laser diffraction, dynamic image analysis, ultrasonic extinction and photon cross-correlation spectroscopy (PCCS), Sympatec makes a prominent contribution to the development, production and quality control of most challenging particulate systems. Typical applications cover dry powders and granules, fibres, suspensions, emulsions, gels, sprays and inhalants within a size range from 0,5 nm to 34,000 µm. Modular instruments show great versatility and can be adapted to the specific task within your laboratory. The proven measurement technologies are also available for integration into your process. Moreover, all instruments reliably deliver most accurate, reproducible and comparable results at shortest measuring times. HELOS | RODOS & Co. The proven HELOS series – with its classical laser diffraction set-up deploying a parallel beam – offers a powerful technology for particle size analysis of powders, granules, suspensions, emulsions, sprays and numerous other disperse systems. A size range from below 0.1 µm to 8,750 µm is mastered. The modular system design, together with a great variety of dispersing and dosing units, provides a flexible adaptation to the most diverse industrial and research applications. In the early 1980s, Sympatec introduced a breakthrough innovation which was leading laser diffraction to another dimension: dry powder dispersion for even the finest, cohesive powders with RODOS. And with the R-series of our laser diffraction sensor HELOS, new benchmarks for precision and accuracy have been achieved. Latest improvements comprise the enhanced application of parameter-free Fraunhofer evaluation down to the submicron regime (below 1 µm), a great measuring signal frequency for best resolution with range combination technology and even more powerful evaluation modes for both, Fraunhofer and Mie. QICPIC | RODOS & Co. 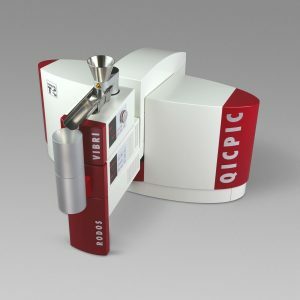 The modular image analysis sensor QICPIC combines size and shape characterization of disperse particle systems within a detection range of below 1 µm to 34,000 µm. Flexible sensor adaptation for analysis of powders, granules, fibres, suspensions and emulsions is provided by a wide range of dispersing and dosing units. Numerous implementations in pharmaceutical and chemical industry, food and beverage technology, and soil science just denote the ­array of applications in industry and research. The most prominent feature is an exposure time within the sub-nanoseconds regime, achieving an image capturing frequency of up to 500 frames per second. 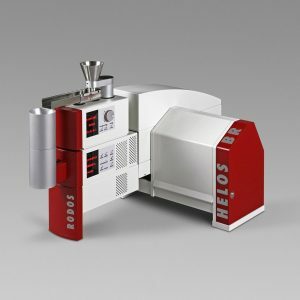 This allows the use of proven dry disperser RODOS for the characterization of finest, cohesive powders. And based on a great number of measured particles, a high confidence level for measuring results is achieved. Powerful evaluation software supports the simultaneous determination of all relevant size and shape characteristics. A particle gallery together with user-defined screening criteria facilitate the creation of specific and meaningful reports. Dynamic light scattering (DLS) is commonly used for nanoparticle characterization. With Photon Correlation Spectroscopy (PCS), scattered light intensities of particles under thermal motion are auto-correlated in order to determine the particle size distribution of nanosuspensions. However, this conventional technology requires extremely diluted samples in order to deliver meaningful results. 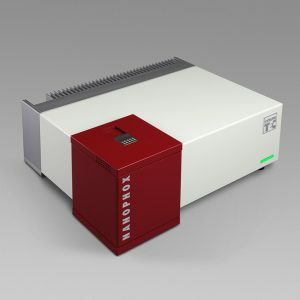 With NANOPHOX, Sympatec exclusively introduces Photon Cross-correlation Spectroscopy (PCCS), which allows for nanoparticle size analysis in suspensions and emulsions at up to a hundred times higher solid contents. The outstanding technological feature of ­NANOPHOX is the acquisition of two separately induced scattered light intensities, which then are cross-correlated. This allows for robust measurements in a wide range of concentrations. In addition to size, the aggregation or sedimentation behaviour of nanosuspensions (i.e. stability) may be analysed. Typical applications comprise e.g., pharmaceutical ingredients, pigments and research on nano­materials in general.